The Cross is the great paradox of Christianity. More than a few people have asked me over the years why the Catholic Church focuses so prominently and persistently on the Crucifix. One inquirer even suggested that the Crucifix hanging above the Altar is too intense a reminder of the sorrow in the world and that she would never join a church that displayed a sign of such cruel violence. Today, we begin Holy Week with the celebration of Passion (Palm) Sunday and we are again reminded of this paradox. Mass begins differently today. 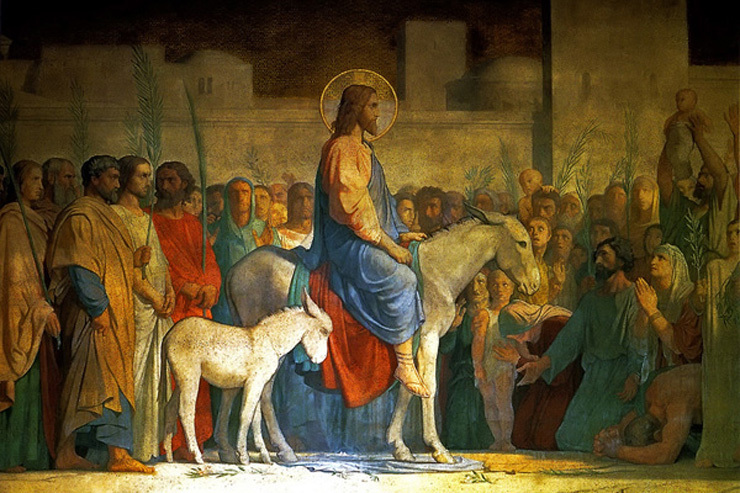 The gospel account of Christ’s Triumphal Entry into Jerusalem by Jesus is proclaimed from the doors of the Church. After the other readings, the Passion Narrative from Matthew’s gospel is proclaimed. From cheering crowds to insane hatred and attack, what are we to make of this? To be sure, this life on earth is filled with hardships, pain and suffering. Who among us has not suffered? Looking back over my life, I can recall numerous occasions of pain. My earliest memories of pain involved occasions of embarrassment as a very young child; the events do not count for much now, but at the time, mortification would not have been too strong a word to describe my feelings. There followed all of the normal moments of discomfort that can be expected to be experienced by a child and young teenager growing up in an affluent country. Real suffering and loss had not yet arrived; no hunger, serious illness or homelessness… but I would come to be greatly affected by death. When I turned 16 years of age, the first loss from death intruded into my life. Uncles and aunts had died previously, but the impact of their deaths on me was minimal. Now I would feel the loss in a most intense way; my father died when the turmoil of the teen years was most challenging. I was lost both due to the hole in my heart left by the death of a father I loved and also due to the selfish anger I experienced which I directed at others I loved and respected. “We know that all things work for good for those who love God, who are called according to his purpose” (Romans 8:28). I did not understand then, but came to know with greater confidence much later in life, that God never forsakes us, especially in our time of sorrow and pain. The most enduring emotion of those days and years following the death of my father was a feeling of separation — the divide that separated my earthly father from me. And the more I thought of this loss, the more aware I became of that separation. For a long while, the dawning certainty that I would never again be together with my father grew. Although I accepted the assurances of family and friends that I would be together again with my father in the life to come, such a thought did not comfort me; it had little meaning. I came to believe that not even time would heal the hurt. Before things would improve for me, I also went through a long period of regret; regret of a son who did not love his father perfectly, regret for all the little ways I failed to return my father’s love when he was alive… and later, regret for how I selfishly redirected my anger towards my mother who was hurting as much or more than I was. There was much work for God to do with me, if I would let him. Time does heal, but not in the way we often think. Many years later, when I began taking my Catholic faith more seriously, I began to meditate on the Persons of God; the Life, Passion, Death and Resurrection of Jesus — the Incarnate God; the lives of the saints and my own life. And so it was that my time with my earthly father and the years since his death became a part of my prayerful reflections. Maybe for the first time, I seriously considered the well-being of my father instead of self. My prayers for him became more urgent, more real. My prayer turned outward, concerned for others and not just for my needs and wants. Through prayer, God revealed to me his (God’s) love that never fails; a love that is never absent from our lives, no matter where we try to run and hide. God the Father was waiting for my humility to overcome pride and self-absorption. I came to better realize that the pain of loss and the heightened awareness of separation from my earthly father also applied to my relationship with God. The cause of the suffering and sorrow of this “vale of tears” was our own doing — the separation from God the Father that we suffered at the Fall of Mankind and continue to cause through our own personal sin. And here is another paradox — the closer we grow in relationship to God, the more aware we become of our separation from him. But for the Christian, this is not a cause for added sorrow alone, but for joy as well; for we come to understand that his love will defeat all sorrow and will erase all pain in the end. This is not a spirit of pessimism or of disordered focus on suffering; it is a spirit of hopefulness. It is said that the souls suffering in Purgatory experience a far greater suffering than we do on earth, for they now know the effect and degree of their sin, the harm their sins have caused and the justice of their punishments, but they are also said to be more filled with joy than we are because they are certain of their destination and of God’s love for them. Yes, their suffering is more intense because they are more aware of their separation from God, but their joy is more intense because they are more aware of God’s love for them and the certainty that they will spend all eternity singing his praises in Heaven… heightened joy of knowing they will soon be with God, but sorrow that it is just not yet. Last Sunday’s Gospel at Mass from Year A, used for the Scrutinies (cf. John 11:1-45), reminded us of this. God loves you so much that he became man to suffer and die so that you might live; for us, a reason for sorrow, yet also a reason for joy. And so, in the gospel narratives for Passion Sunday, we see the joy of the entry into Jerusalem and the horror of the Passion. We will not see the joy of the Resurrection until the victory over death is apparent on Easter Sunday. “… we rejoice in our sufferings, knowing that suffering produces endurance, and endurance produces character, and character produces hope, and hope does not disappoint us, because God’s love has been poured into our hearts through the Holy Spirit which has been given to us” (Romans 5:3-5). There is no joy without suffering. There is no life without death. It need not have been this way, it is not God’s design; it is ours. Now that we know, now that our God has revealed to us his infinite goodness and love for us, we are able to bear our pains and suffering upon the hope and joy that Jesus has won for us. And with this knowledge, we are able to grow spiritually, grow in holiness; knowing that nothing in this life need be lasting… no sin that is unforgivable, no one lost who is beyond redemption, no sorrow that cannot be healed with God’s love and mercy. My father taught me the love of God by how he lived his life. The sorrow I experienced after his death led me to become intensely aware of our separation, but more importantly of his love and goodness. That realization led me to better appreciate God the Father’s love for me even while making me more aware of what separates us. The sorrow that comes from that awareness causes an even greater desire to overcome that separation made possible by Christ’s death on the Cross. And in that realization, there is much joy and hope. is filled with joy for love of God and gratitude for and acceptance of his mercy. Be assured of God’s love for you. Seek by his grace to heal the damage of sin. Seek communion with him and with those who make up his Church and those who are not yet within. His love for all of us is unconditional. His joy is infinite. His mercy overflows. We should be no different, for by his Passion and Death, Christ has won a great victory for us; a victory that is made manifest on Easter. Rejoice and be glad, even in the midst of suffering. The readings for Passion (Palm) Sunday (Year C).